Bob Dylan & Johnny Cash, 1969. The original "Mountain Dew" was made up by Bascom Lunsford, who has directed a mountain folk festival in Asheville, North Carolina, for almost 30 years. After I returned to Chicago, I remembered the melody and composed a new set of verses for it. Lulu Belle and I cut a Vocalion record of it in 1939 in Chicago. Roy Acuff and other Nashville singers learned it from our record and started singing it. Station WLS, where we sang for 25 years, would never allow any mention of giggle water or tobacco in those days, so we were never allowed to sing it on the National Barn Dance. Mr. Lunsford came to Chicago after our version of the song became well-known and was elated with what we had done with it. He, John Lair of Renfro Valley and I sat in a Chicago hotel one evening discussing old songs. Mr. Lunsford said, "I believe I know how to pay my bus fare back to Asheville; I'll just sell Scotty my interest in 'Mountain Dew' for $25." I wrote a brief agreement on hotel stationery and closed the deal. After we retired, he came to visit us. I called the publisher and BMI and gave them instructions to pay him 50 per cent of all royalties on the song during his lifetime. He is almost 90 now. Scott Wiseman, Letters, Apr 8 and Aug 8, 1973; reprinted in Dorothy Horstman, Sing Your Heart Out, Country Boy, New York, NY, 1976, p. 119. 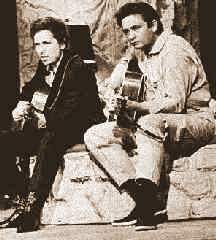 Covered by Bob Dylan and Johnny Cash, Columbia Studios, Nashville, TN, Feb 17-18, 1969. There's a jugful of mountain dew. It had such a sweet smellin' phew. It was nothing but good old mountain dew. He's sawed off and short. He's just five feet and one inch or two. Just from smelling that mountain dew.